Last spring, I made a big decision to teach part-time. And now, here at the end of October, I find myself two months into my new schedule and simplified life. Guess what? It’s totally awesome. =) No, really. I am SO thankful that God made it possible for me to team teach and that he gave me the courage to go for it. 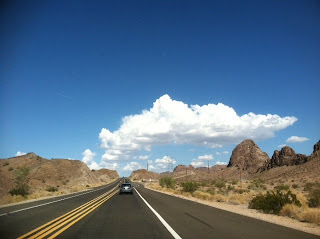 Some wide open space and the beautiful sky from a weekend trip I went on to Arizona. I’m doing a lot of the same things I was before, but now I have time to actually enjoy myself while I’m doing them. I’m still teaching and loving kids, ministering at church, hanging out with friends and family, homemaking and hostessing. But I’m not stressed as I do all those things! I may have shifted my teaching schedule to part-time, but I’m still living life full-time. My closet is still a hot mess. Turns out that no matter how much extra time I have to do chores, I am still horrible at doing laundry efficiently. I don’t know what my deal is. I keep trying to figure out a new system that will save me from drowning in a pile of clothes, but so far, just shutting the closet door is the only thing that’s working. I think I’m okay with this, but if you hear me complaining about not having any money to go shopping for new clothes, just tell me to go do laundry. I’m sure I’ll find something great that I completely forgot I own, and I won’t have to spend a dime! Hurray for living a balanced life! It is a MAJOR challenge for most people, especially dedicated and passionate teachers such as yourself. So happy for you and thankful that you have chosen to enjoy life abundantly. It’s a great feeling when you make a big decision and not regret it. Good job!